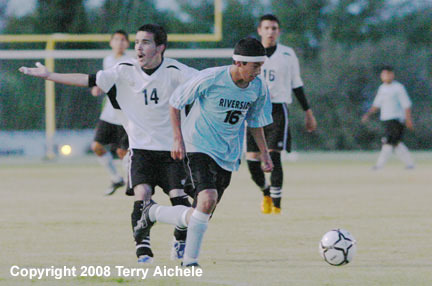 Riverside put a lot of pressure on Irrigon's goal during the Thursday evening match. 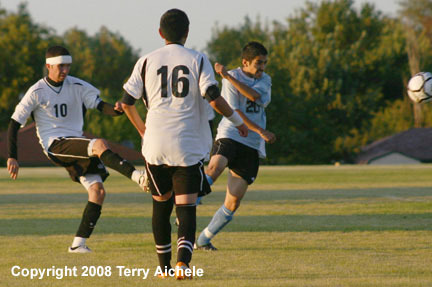 IRRIGON - The Irrigon Knights hosted the Riverside Pirates in a non-conference soccer match Thursday evening. The Pirates won 6-1 in a physical match up. Riverside scored in the opening five minutes and set the tone of their dominating play for the rest of the game. Irrigon played tough and did show a good defense but Riverside was able to play most of the game in the Irrigon half of the field. The Pirates next score came during the 12th minute of the first half. The third goal by Riverside came in the 22nd minute to take a 3-0 lead. Irrigon go on the board in the 33rd minute of the first half with a goal #10. When the first half ended Riverside led 3-1. The second half went scoreless until the fifth minute when #16 of the Pirates scored on a drive up the middle for a 4-1 lead. Riverside scored next in the 14th minute to take a 5-1 lead. Fourteen minutes later in the 28th minute Riverside scored their goal from a angled kick from the left of the goal giving them the 6-1 lead. It looked like Riverside may have scored another goal in the last minute of regular time when the ball rolled into the net following a scrum directly infront of the net. There was a moment of confusion as the referee sorted out what happened. It turned out that the goalie had control of the ball and it was kicked out of his hand and rolled into the net. 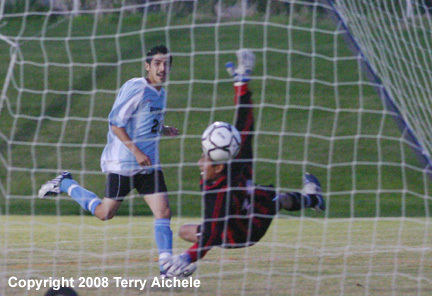 Under the rules of soccer if the goalie has control of the ball play stops. The goal was waived off and the teams played the stoppage time with no one coming close to a goal. The final score was Riverside 6-1. 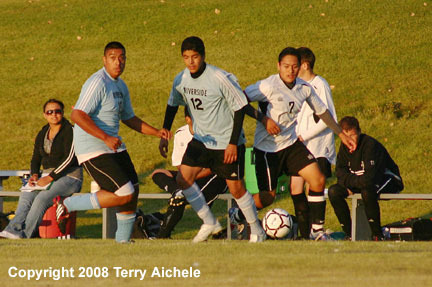 LEFT - Two Riverside defenders, in the blue, pinch down on an Irrigon player. 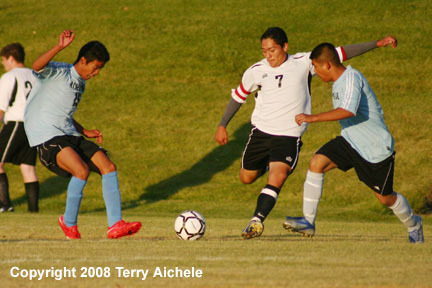 RIGHT - An Irrigon players squeeses the ball between two Riverside defenders. 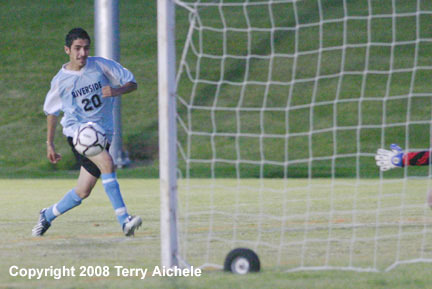 LEFT - Irrigon #10 takes a shot on the Riverside goal during the first half. The shot was stopped by the goalie. 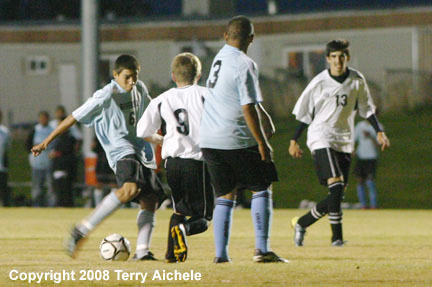 RIGHT - An Irrigon player gestures to the referee hoping to get a call. LEFT - Riverside #20 works the left side of the box and lets loose a shot on goal. RIGHT - Riverside #20 watches his shot make it into the goal to take the score to 5-1 for the Pirates. LEFT - A Riverside player takes a shot on goal in the second half of the match Thursday. 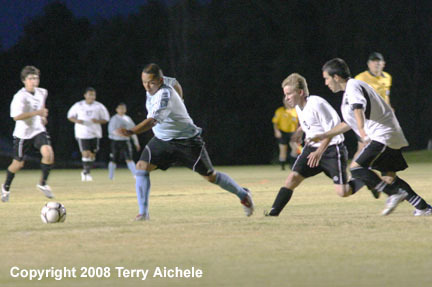 RIGHT - A Riverside player moves the ball to his right in an attempt to get around Irrigon defenders. 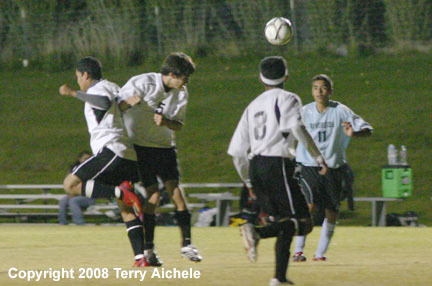 LEFT - Irrigon defenders battle to control the ball late in second half. 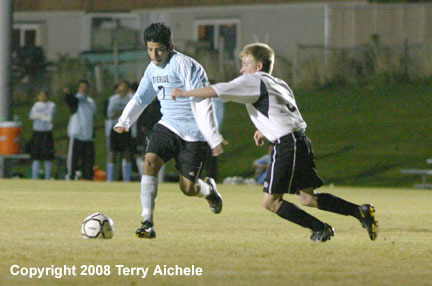 RIGHT - A Riverside defender brings the ball in the Irrigon zone.